The Swedish artist Gunnar Tryggmo was born in 1969 in Växjö, Sweden and grew up in Sjöabro, a scenic spot deep in the middle of the forest in Småland, a province in southern Sweden. The forest’s massive diversity of animals and birds caught Gunnar Tryggmo's early interest and it became a natural source of inspiration to him. After high school Gunnar Tryggmo moved to Helsingborg, a city in southern Sweden which faces Denmark, in order to study painting and drawing at Sundsgårdens College. 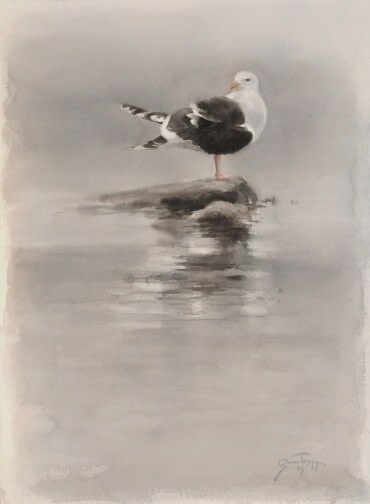 Gunnar continues to be inspired by nature and in particular by animals and birds in their natural environment. The Swedish landscape, which varies dramatically from the wild coastline to the heavily forested interior, offers up a never ending palette. His artwork is largely characterized by his ongoing interest in the wild and wild life in general. Of his painting he says "The values, the mood and the moment are the most important forces in my paintings". Gunnar is an Associate member of the Society of Animal Artists and in 2014 exhibited at the Mall Galleries, London at the DSWF Wildlife Artist of the Year exhibition.